Cambridge Audio TV5 v2 review | What Hi-Fi? When the first TV5 soundbase came out, there was a lot we liked about it. It had a punchy bass, a powerful sound, was sensibly sized and pretty well priced – an all-around quality product. With the release of the TV5 v2, the company is looking to build on its success. 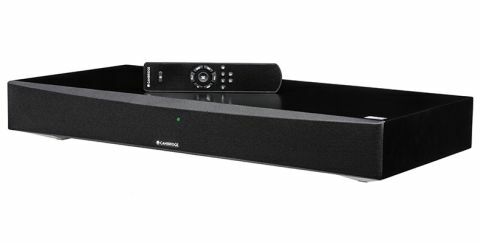 This soundbase has a new digital sound processor (DSP) for converting digital signals into audio, and its been given a HDMI input for playing high-res audio, alongside its conventional ports. While this all sounds good on paper, how do Cambridge Audio’s improvements fare in practice? The TV5 v2 has the same design as its predecessor, and should fit in to most environments discreetly. Physically, it’s a sturdy piece of kit, and at just over 70cm long should sit happily under most televisions. Facing you are two 6cm drivers, while underneath are a couple of 16cm subwoofers for the low frequencies. And there’s a lot you can connect up to this soundbase to make those drivers work. The TV5 v2 has a 3.5mm input jack, an RCA connection, an optical input, and aptX Bluetooth connectivity, as well as the HDMI cable for 24-bit/192Khz audio. If you want to tweak that sound, the v2’s EQ settings are nominally similar to the original TV5: ‘Music’ is a flat EQ (and the one we keep the v2 on); ‘TV’ enhances vocals and the upper bass; ‘Film’ enhances vocals and increases lower bass frequencies for big scale effects like explosions, and ‘Voice’ restricts the bass and treble to reinforce speech. And, like the first TV5, the v2 lacks a display - instead opting for an LED that changes colour to signify audio input. Aesthetically, this feels a little too much like Hal 9000 is staring at you from beneath your television, but ergonomically means you have no way of telling numerically your overall volume, subwoofer volume, or which EQ setting the soundbase is on. One thing that Cambridge has redesigned is the remote, but that’s a mixed bag overall. The input buttons can get caught under the remote’s top plate, feeling noticeably inferior to the indented, central mute button or the ridged EQ buttons. If you find that it’s not to your liking, however, the TV5 v2 does support IR learning, so you can control it with other remotes. But get past some of its questionable design elements, and the v2 has a superb sound quality. Putting it through its paces with a Blu-ray of Guardians of the Galaxy, connected to the soundbase via its optical input, and we’re treated to an impressive performance. We skip to the scene in which the heroes escape the prison base, and the v2 has enough dynamism to fill our medium-sized testing room. Between the earthy clunk of Rocket Racoon loading a space-age gun, the subsequent high-octane shootout, or Gamora’s softly spoken insults, the soundbase handles each element with ease. And it keeps those elements nicely organised; while the gang is working out its plan, the TV5v2 ensures that you are aware of everything that’s happening – little aspects like the sound of wires being pulled or Rocket’s humming as he hotwires the battery aren’t lost beneath the soundtrack. The bass is tight, too. The quick thuds as the alien Drax knocks out the human security guards are responsive and punchy, and the explosions as Starlord (Chris Pratt) destroys the prison’s robots are satisfyingly forceful. Changing to something more down-to-earth, we plug the HDMI cable into the TV5v2 and play The Imitation Game Blu-ray. There’s a great amount of insight in this soundbase; Hugh Alexander’s (Matthew Goode) angry hurl of a glass at the Enigma Machine shatters with a precise crispness - the TV5 v2 digging up detail you might not otherwise hear from your television. This quality extends to the midrange as well. When John Cairncross (Allen Leech) asks Alan Turing (Benedict Cumberbatch) whether he wants lunch, the croak in Turing's baffled voice is palpable and believable. While the TV5 v2 might be marginally behind in terms of midrange detail when compared to the similarly priced Canton DM 55, it does have a greater sense of scale and a more potent bass than the DM 55 to make up for it. Much like the first TV5, this soundbase’s lack of display means that it’s not quite as easy to use as other, similarly priced options. If a TV5 v3 comes out, we’d like to see one added. But sonically, the TV5 v2 is a great soundbase. The bass is tight, the midrange is full, and it provides a good amount of dynamism across any input. Cambridge Audio knows how to make a soundbase that sounds good, and ultimately that’s what gets them rated so highly.